The Pareto’s Principle as applied to your business is a great way to increase profit using 80/20 rule and is a worthy exercise if you desire to improve cash flow and increase the value of your business. However, many entrepreneurs struggle to recognize where they are making money and where they are not! 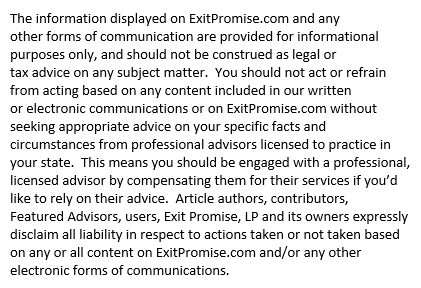 To take advantage of this article to its fullest extent, we recommend downloading the ExitPromise Increase Profit 80/20 Rule Tool! We shared with our readers the first step in Understanding the Importance of a Minimum Order in our last post. If an entrepreneur undertakes this first step, they have a complete top down list of her customers or clients—those producing the greatest to the least amount of gross revenue to their business. With this information, the entrepreneur is now armed with extremely valuable information to understand where they are making money and how they may improve the value of their business. Without this understanding, an entrepreneur will undoubtedly, leave money on the table. To the delight of many successful entrepreneurs, the Pareto’s Principle applied to their customer base gross revenues tells them exactly the source of their profit as well as their unprofitable relationships. By applying Pareto’s Principle, also known as the 80/20 Rule, an entrepreneur will uncover the true source of their company’s profit. The Pareto Principle is defined as: approximately 80 percent of the effects are derived from 20 percent of the causes. What this means in a business setting is that 80% of a company’s profit comes from 20% of its customers. If you have completed the first step in this exercise, you have your list of customers sorted from the greatest gross revenue to the least. To assess if Pareto’s 80/20 Principle applies to your business, follow these instructions. Add up all of the gross revenue from all of your customers for the past twelve months. The Quickbooks® report from the first exercise should show you this amount on the bottom of the page. If not, total the gross revenue from this list. This amount should represent the total gross revenues of the business over the past year. Starting at the top of your list of customers, begin to add the first customer gross revenue to the next, and the next. Repeat this until you reach approximately the figure you have from step number 2 above. When you reach this amount, stop and draw a line below this customer on your list of customers. ** The customers that appear above this line are those customers that produce for your company approximately 80% of its total gross revenue. Count the number of customers that appear above the line in step 3. Count the number of ALL customers in the total list of customers. Divide the figure from step 4 into the figure from step 5. ** This amount represents the number of customers (percent of the total) that produces approximately 80% of a company’s gross revenues. Pareto’s Principle states that it is very likely 20% of a company’s total number of customers produces approximately 80% of its gross revenue. What is the percent of total customers that produces 80% of your company’s revenues? In our next post, we will share insights to be gained from the 80/20 rule to help you improve the value of your business. By understanding the Pareto’s Principle and applying it to your business, an entrepreneur will be less likely to leave money on the table!